I know the holidays are a few weeks behind us, but I'm finally getting around to jotting down a few thoughts and sharing a few photos from that magical time. The entire month of December was full of fun from cookie making, gingerbread house decorating, and light drives. We made sure savor the season. Although you didn't know what was coming, on Christmas Eve you knew there was excitement in the air. After stuffing your little belly on dinner, you patiently waited for the signal that you could help to hand out presents. On Christmas morning I work before you, more excited for what was to come than you probably were. 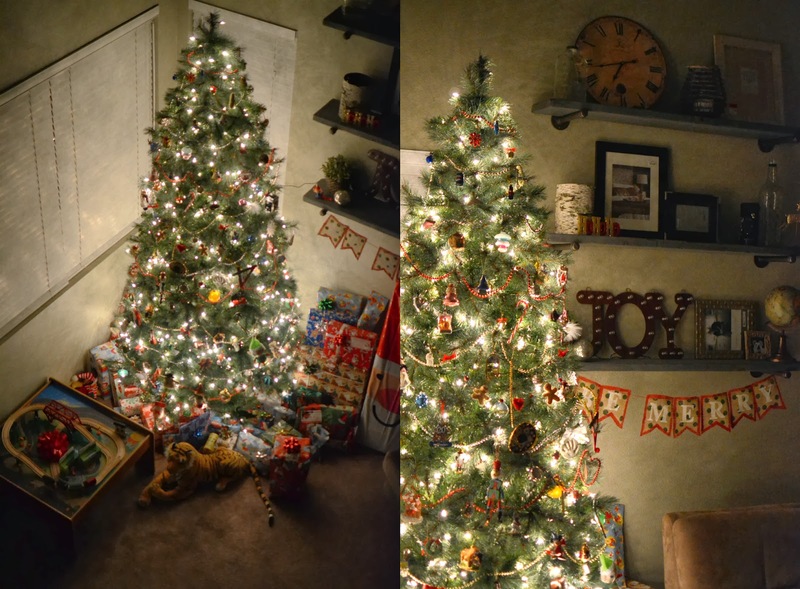 The tree sparkled and the presents from Santa were proudly standing by the tree. It was so fun seeing your joy as you explored your new toys, opened presents, and responded to our cries of "Santa" with a hearty "Ho, ho, ho". 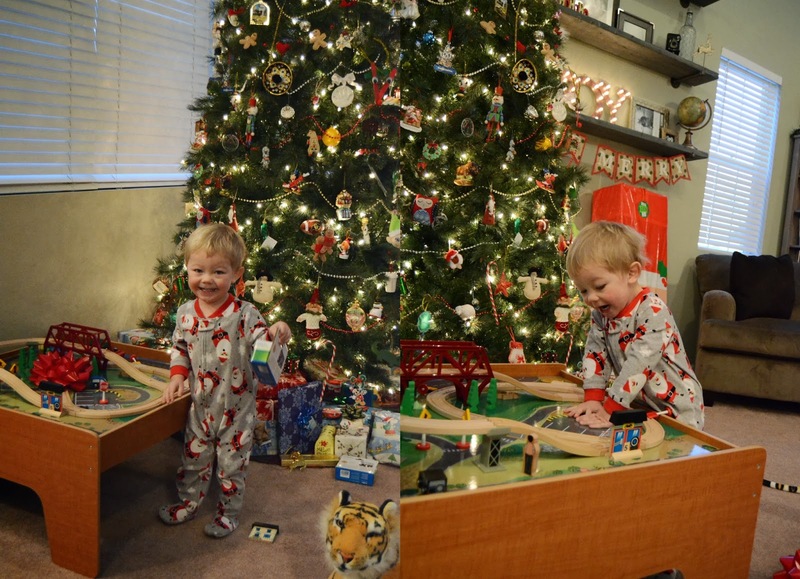 This year Santa left you a "choo choo" table, and although you haven't developed a deep fondness for trains yet, you did find the toy to be hit. You make every moment brighter my baby boy. I will always remember this Christmas, your third since being born, the year you were two, as the one were you walked to the top of the landing before going downstairs, peered over the edge and let out the faintest "WOW" as you took it all in. That moment made all the holiday hustle and bustle worth it and then some. It was a defining moment in my role as your mommy; your awe was the reassurance that maybe I am doing alright in my role. Our holidays were memorable, they were joyful, they were blessed. As you grow my little boy, I hope you never lose sight of the meaning of this holiday, and that it always carries with it a magical spirit of love, hope and beauty. I hope you always open your heart to share your blessings with those that need it most, because although we are so fortunate, the season can also be a difficult time for many. Thank you for always making my days merry and bright throughout the year. Please continue on with the circle and make the jump over to Chantell's blog and read her monthly letter and see her breathtaking photos. I just love the one of him looking down from the top of the stairs. Such a great capture! this is so great, I wish I would have thought about doing something like this!